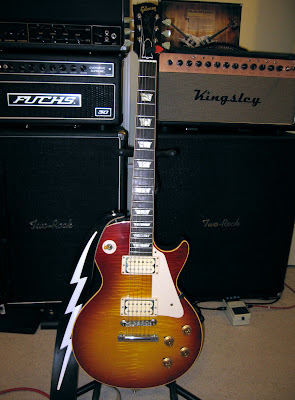 Ever since I had my R9 Les Paul I have had a problem with the pickups being too microphonic for high gain, high volume amps. Some time ago I also changed the pickups in my R7 Les Paul for the same reason (in that case I replaced the OEM pups with a Duncan Jazz and a Duncan JB, neck and bridge respectively). I wanted to try something a little more "special" in my R9 since I really did like the sound of the stock BurstBuckers that it came with. So, during my "Great Acquision" :) I scored an assortment of WCR pickups at great prices. Two of them happened to be exactly what I was looking for to put in my R9... a double cream WCR Goodwood (bridge) and a double cream WCR Crossroads (neck). This is the "American Steele" combo set as seen on the WCR website. I love the sound of these pickups in my R9. They have a lively, harmonically rich tone and are very responsive to input. The output is in the lower range, as you would expect from a PAF clone, so they are both very open and woody sounding... but with plenty of high-end "spank" that helps tame some of the dark muddiness that a mahogany body can produce.